Discussion in 'Announcements' started by Katsuruka, Nov 1, 2014. Before voting, please make sure you have a level 15 character on the account you are voting on and that you are logged out of the game on this account. If you have any general questions about voting and vote abuse, feel free to ask on this thread. If you have more specific, personal enquiries, please contact myself (Katsuruka) via PM on the forum. I'd suggest also adding John to the conversation if you don't hear from me within a day or two, or if the issue is urgent, in case I am away/ill/busy. Please note that Dustin no longer handles voting issues as he's very busy with his studies. Updated 4th November 2014 to reflect voting changes. We are no longer using Ultimate Private Servers; instead, players will get 8k NX for voting on Gtop100. You may vote once on Gtop100 per 24 hours. This will give you 8k NX per day. No matter how many accounts you have and how many different locations you are able to vote from, you must follow this rule. If you try to gain more than 8k NX per day by voting on multiple accounts from different locations you will be banned for vote abuse. Your household may vote once on Gtop100 per 24 hours. You will have to take turns in voting with other Royallers in your house. For example, you can vote one day, and your brother can vote the next day. Your household is only allowed to receive a total of 8k NX per day, regardless of how many of you live there, how many computers you have and how many different locations you can vote from. 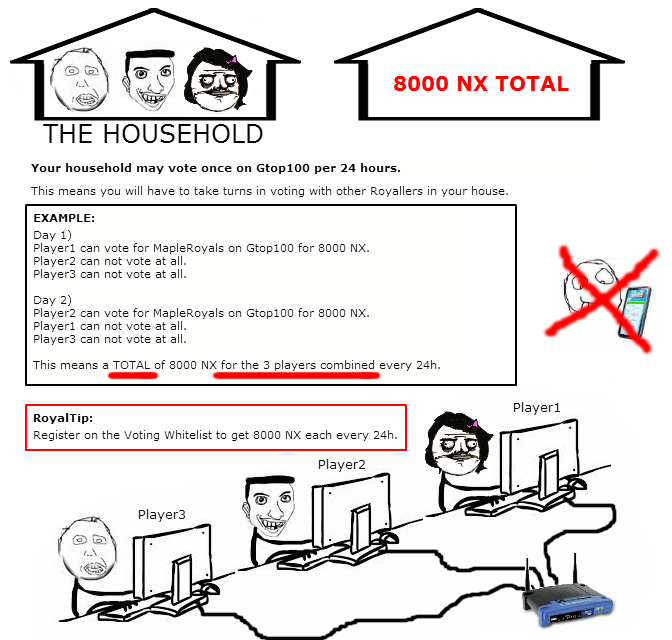 If you try to gain more than 8k NX per household per day, your whole household will be banned for vote abuse. Yay! Each of you may vote once on Gtop100 per 24 hours. One member of the household will be able to vote from their computer; the others will have to vote from their phones or other mobile devices (using 3G/4G, not your home wifi). This will give each of you 8k NX per day. If you try to gain more than 8k NX per person per day (for example, if we find out you have invented a "brother" just so you can get more NX) your whole household will be banned for vote abuse. Pleased note that you have to be ACCEPTED on the Whitelist before you are entitled to one vote each per day. Where's this whitelist and how do I register for it? What if I was on Dustin's old whitelist? Sorry, you will need to reapply for the new list, as the criteria for being accepted on the whitelist is slightly different than previously. What if my friends regularly come over to my place for a MapleRoyals LAN party? If they mainly play at your place, you don't have to apply for the whitelist but we would stongly advise you to in order to avoid them being mistaken for you vote-abusing. If you apply for the whitelist, give their character names and include them in the photo of people who play MapleRoyals from your household. If they mainly play at their own places, advise them to log into the game from their own place and computer prior to next voting. Do you really need all this information? Can't we just PM you with our account names? How will I know if I've been accepted onto the voting whitelist? I've been accepted on the whitelist but I still can't vote each day! Firstly, make sure that one of you is voting from their computer, and the other from their 3G/4G phone (or a different location, such as their workplace). Secondly, if both of you use the same computer to play MapleRoyals from, the system will see you both as the same person and only allow one vote per 24 hours. If you each have your own computer, it's best to stick to playing on your own computer to avoid this happening. If you only have one computer between you, then unfortunately you will have to take turns voting. This is inbuilt into the the system itself, and the whitelist cannot override it. I tried to vote and I got a message telling me that either I am a robot or I am behind the Great Firewall of China. Help? We have a new captcha on our voting page, and for most people, it will be a case of just ticking the checkbox and voting. However, if you live in China, you may be unable to see the captcha because it is created by Google, and Google is blocked in China. Ordinarily, we would discourage people from using VPNs, but you may have to do this to be able to vote if you live in China. (Gtop100 has the same captcha). If you don't live in China and still can't see the captcha, then try configuring your adblock settings for our site to allow it. A big thank you to @SAKI for the excellent cartoons! jremix160, Jacob66, Selma and 8 others like this. jsy0221 and Manslut like this. Vinilos, TJPROX, Andrew3046 and 3 others like this. Well me and my cousin live in different household. we vote in separate places. but sometime he play in my house. (never vote in my house or vice versa) will i get ban if i dont fill out the list?? That's a requirement if you have more than one person playing in the same household. Voting rules haven't changed for those who play alone in their house. ITT: People who haven't taken the time to fully understand the change. Well if you don't like it don't do it, it's good for those who actually want to gain full nx. Wow having to submit a photo how could this happen.... i don't see anyone putting a gun against anyone's head. You won't get banned for it but if you are trying to abuse the rule they will find out. Since you haven't gotten banned yet, you shouldn't have to fill in the form as they can tell you're two different people who live in different households. This is ONLY for people who live in the same household and/or people who don't but mainly play at each others homes. "Your ability to become offended so easily is offensive." Ben Astarb, Gags, Dylanducki and 1 other person like this. Iam the only person in my household who plays Royals. I was able to vote on gtop100 but when i try to vote on ultimateprivateservers i got an error. I was trying to see this list but wasn't sure? I live in a dorm and I wanted to somehow register my laptop as my laptop voting for my account. How would I do such a thing? I believe that Dustin has done this in the past, too, except that he dealt with voting whitelist stuff by PM rather than having any kind of formalized registration for the whitelist. This seemed the simplest and least intrusive way of establishing that people voting from the same household are separate people and can show that they are at least together in the same household for a photo. I deliberately did not request full names or proof of address, even though this would be much better evidence that people were in the same household, as I would prefer to keep this as unintrusive as possible. Also, nobody has to fill this form in. Nothing is being lost if you don't, you're just carrying on with the system as it has been since July. If he just plays from your house from time to time, there is no problem! It's a good idea for him to login to MapleRoyals at home prior to voting again so that it registers his own details in the database and there's no confusion. Just PM me with the details, please (character name(s), and IP and MAC address,) and I'll make a note that you're on a university network. It appears UPS recently reset their list entirely. We will be resubmitting our site and getting it back on the list so you can vote for it as soon as we can. Thanks! heh.. the benefits of being the only one playing in my household is too strong! but yeah, seems like fair rules. I was wondering, what about people who don't like showing their faces? Isn't a photo of their bodies & and the pieces of paper enough? I know many people who have privacy issues or are uncomfortable of showing their faces. Even if it's only the GMs who have worked over 4 months who can see it. What about a Skype call with both of them to compensate for not showing their faces however you can clearly see who's talking or who's who and that you can tell that how they claim to be related is obvious? I see it as if you only needed a skype call I can go over to a friends house or him to me and I get extra nx. It's not that simple but it will make the life of a GM harder I guess. Then you're voting more than once every 24 hours? I mean if you vote in your house and then in you're friends house then you are in fact vote abusing. And you would still need to fill out the application and not only do a Skype call, that is what I meant when I asked if Skype could be added to provide enough info and not to replace the application. I meant having a friend impose as someone living in my household, and i meant signing up for the list with that "friend" and then i'm free to vote twice a day. I also said that it's not that simple since they will notice if you would do that, but could also make it easier for people to try breaking the rules and giving the GM more work. You would get found out the instance you did it. If you vote twice with this time also using3g/4g on another device then on your WiFi with your computer (taken that it's what you vote with most of the time) and then they see that your friend votes at his home. Well shortly said they would notice that someone or some are voting 3 times a day. And even if your friend didn't play MapleRoyals and did it so you could vote 2 times a day you would still eventually get found out and you're risking your privacy & getting banned from the server(temporarily) and from the whitelist(I believe permanently) to vote 2 times a day. And it's not even a big deal if 1/100 try to use it with bad intentions of abusing the whitelist because there are no big repercussions of doing it (that I can think of atm). Unlike hacking or scamming where someone else gets harmed and these things occur on a daily basis anyways. i personally don't have 2 accounts, i dont even know if thats allowed i think it is, but if you do would that make voting complicated?